The thought of winter coming in depressed me this morning when I was tending to my plants. They just survived a nasty nightlong storm but they surely are enjoying this pleasant weather and everything seems to be in full bloom! My hot chili plant is covered with tiny little chilis budding out of their white little flowers. The tomato vines are longer than ever. They might be crawling into the neighbor's terrace soon! The purple salad chili is still sprouting up now and then. The beginning to a handsome okra. I cooked up all the rest from the garden yesterday. I cooked it with the broad beans from the garden as well, and boy was it delish! Everything tastes better when they are from your own garden. What I thought was a type of squash is actually a kind of cucumber. Its round in shape and extra crunchy! The broad beans have also been sprouting all over the little plant. I can't get enough of this vegetable. After a long wait, the zucchini has finally decided to show it's pretty face. Let me tell you what the tiny little red dots are. Some of my plants have been infected by these minuscule black bugs. The round cucumber plant just survived it and I noticed some on this plant this morning. There is an easy fix to it - mix soap and red chili powder in water and wash your infected plant with it. Those tiny red dots are from the chili powder. Limes are growing in every little corner of the lime tree. I have no idea how big they should get before I can pluck them. But I can hardly wait. The jalapeno plant has survived a major infestation. I had chopped all of the plant off leaving about 2 inches. And now look at her. 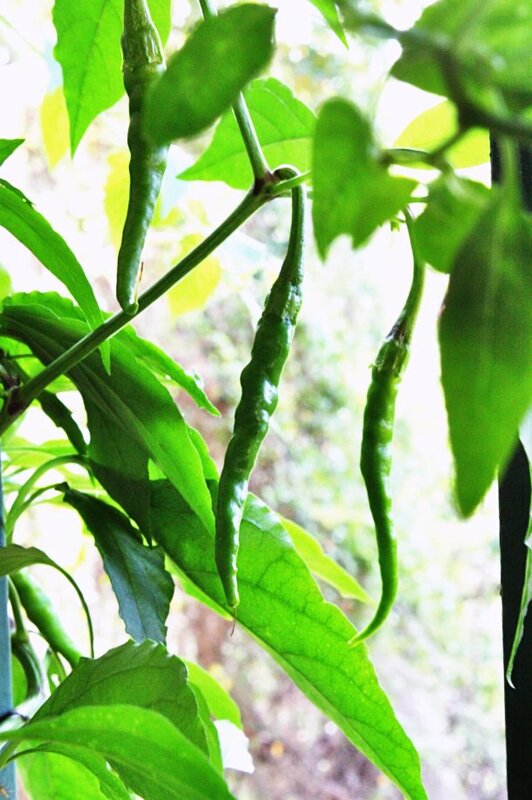 Every branch is sprouting with jalapenos. The herbs are also doing well. I literally have to chop off the basil and the lemongrass and throw them outside. I didn't know basil plants could get so big. The rosemary is also getting quite big. I use up the chives as soon as they grow out as well as with the baby spinach. My mother has ever so intelligently planted cilantro around the edges of all the planters. So every pot is sprouting with cilantro that I put in most of my recipes.